DID HE SEE TRAGEDY COMING? 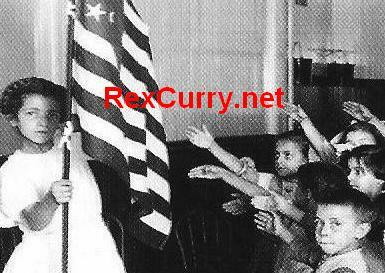 Francis Bellamy inspired shocking photographs of the Pledge of Allegiance http://rexcurry.net/francis%20bellamy.jpg that reveal frightening chapters of American history. Bellamy was born in 1855 and died in 1931. The National Socialist German Workers’ Party had been in existence since 1920 (with electoral breakthroughs in 1930 and dictatorship in 1933). Bellamy was also a self-proclaimed national socialist and a member of the "Nationalism" movement and a vice president of its socialist auxiliary group, whose members wanted the federal government to nationalize the American economy. He wanted all of society to ape the military. 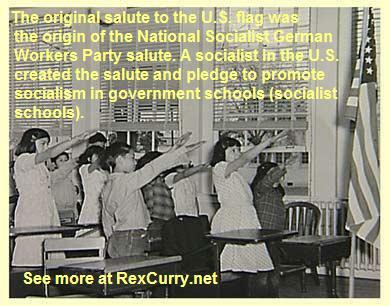 Bellamy saw government schools as a means to create an "industrial army" (a Bellamy term) for his socialist "Nationalism." Bellamy espoused "military socialism" as did his also-famous cousin and cohort Edward Bellamy author of the international bestseller "Looking Backward" in 1888, translated into German, Russian, Chinese, etc. Bellamy was also a supporter of the "Christian Socialism" movement. Although the original Pledge did not contain the phrase "under God," that might have been an oversight, in that Bellamy's articles that accompanied the pledge do contain that phrase and other like references. A fundamental problem exists in the separation of religion and state: the secular faith that government should be mixed with education; that government should convert the masses to embrace socialism. Government schools (socialist schools) are no less grounded in religious faith than are churches; the crucifix in the church was similar to the flag in the classroom for Francis Bellamy. It did not alter the basic nature of what he believed. Bellamy proposed his pledge and salute in an article about a Columbus Day celebration he wrote for the “Youth’s Companion” magazine. 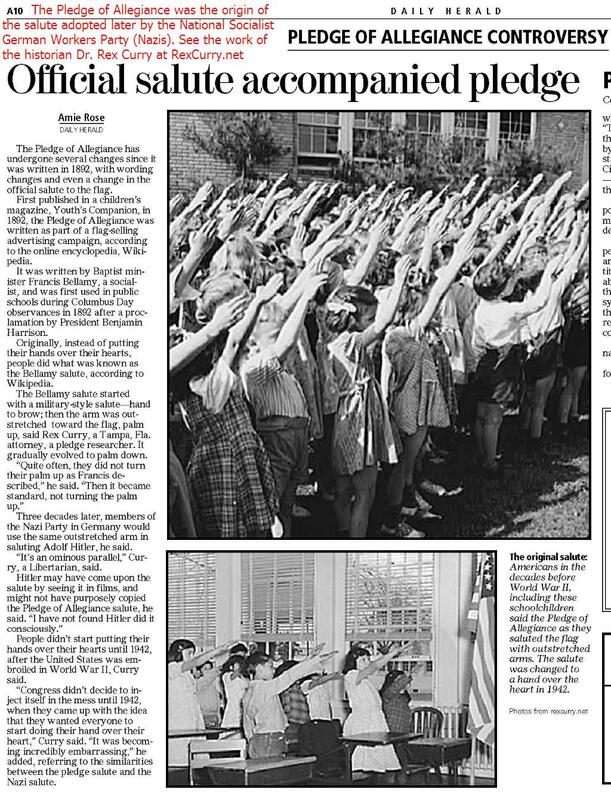 The end of the article states “Photographs both of the salute to the Flag and of some aspect of the Review would be prized local momentoes. One of these photographs, as well as the account of the Celebration clipped from the local paper, would also be appreciated in the office of the Chairman of the Executive Committee." (With Francis Bellamy listed as the Chairman of the Executive Committee). Historical sources suggest that the celebration was widespread and that Bellamy may have received a trunkful of photos of children in government schools reciting the socialist pledge and giving his straight-arm salute to the U.S. flag. Near the end of Bellamy’s life, as the monstrous National Socialist German Workers’ Party grew, but had not yet attained dictatorship, Bellamy's collection of 1892 photos would have suddenly taken on a disturbing appearance. 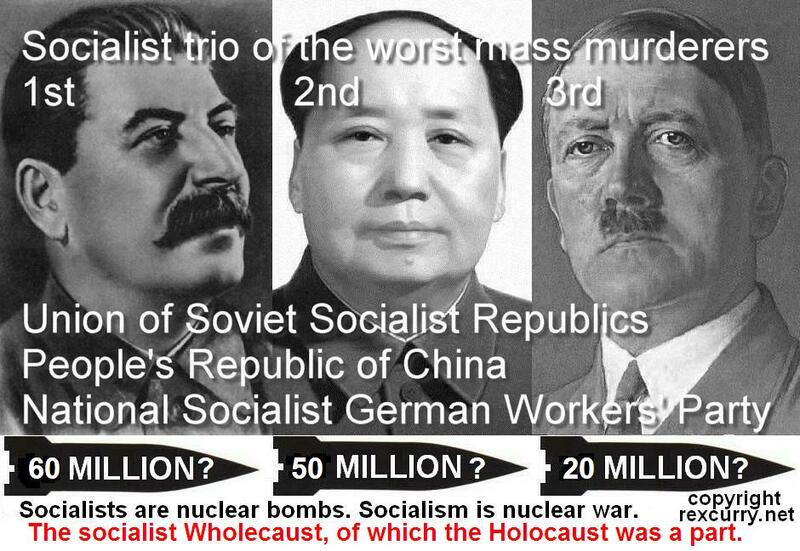 The socialist wholecaust (of which the Holocaust was a part) involved the three most murderous regimes: (1) Germany under the National Socialist German Workers’ Party, 21 million, 1933-'45; (2) People's Republic of China, 35 million, 1949-'87; and (3) the Union of Soviet Socialist Republics, 62 million deaths, 1917-'87 (Death tolls are from Professor R. J. Rummel's book "Death by Government"). Francis Bellamy lived in the U.S. during the first 14 years of mass atrocities and socialist disasters in the Union of Soviet Socialist Republics. It is possible that Francis Bellamy was not aware of the horrific realities of his socialist ideas in the U.S.S.R. at that time. "Ich schwöre Treue auf die Fahne der Vereinigten Staaten von Amerika und die Republik, für die sie steht, eine Nation unter Gott, unteilbar, mit Freiheit und Gerechtigkeit für jeden"